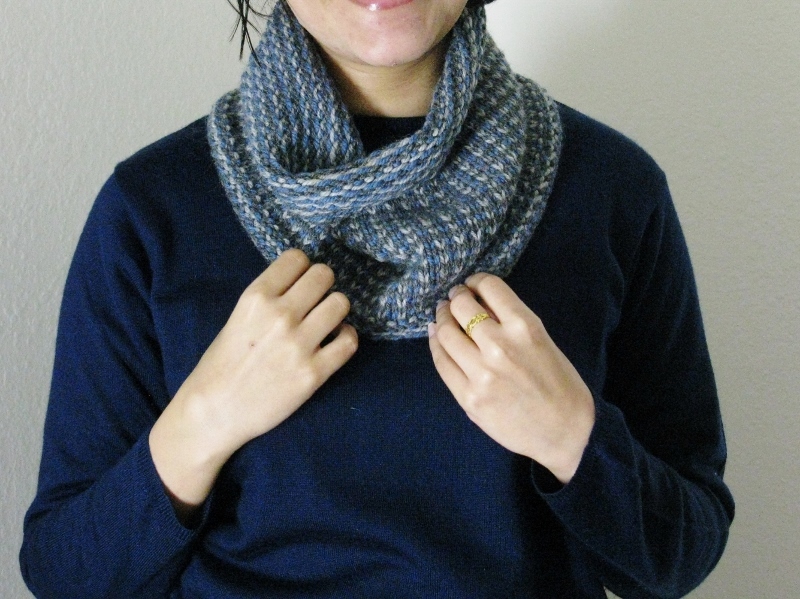 Posted on December 6, 2013 by Sandhya S.
This cowl uses three colors of worsted weight yarn. It is worked flat in a six-row, slipped-stitch pattern, and seamed. You knit from the bottom up, changing colors every row, but using only one color across one row. Casting on loosely is recommended because you start slipping stitches on the very first row after casting on. 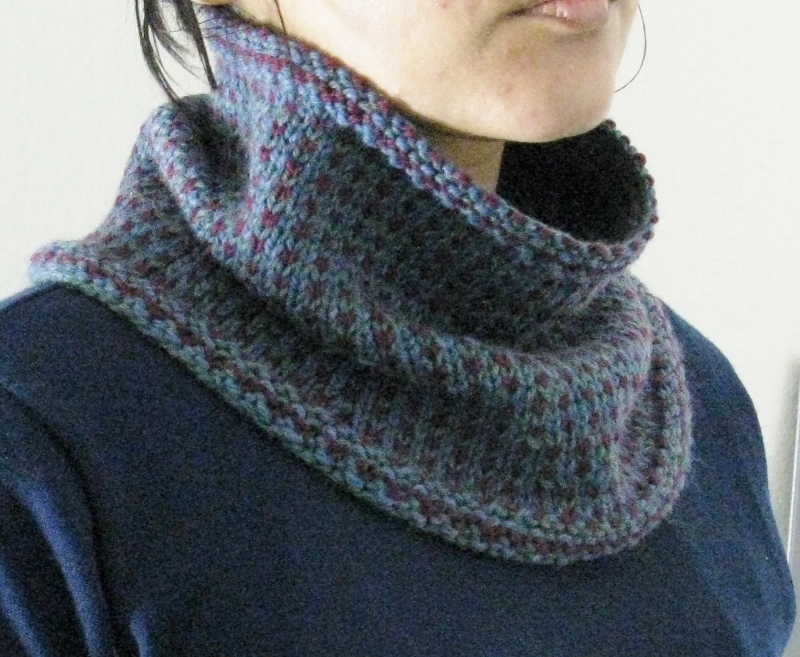 The lower border and body of the cowl are knit using US size 9 needles (or size needed to get gauge). For the top border, you switch to smaller needles. 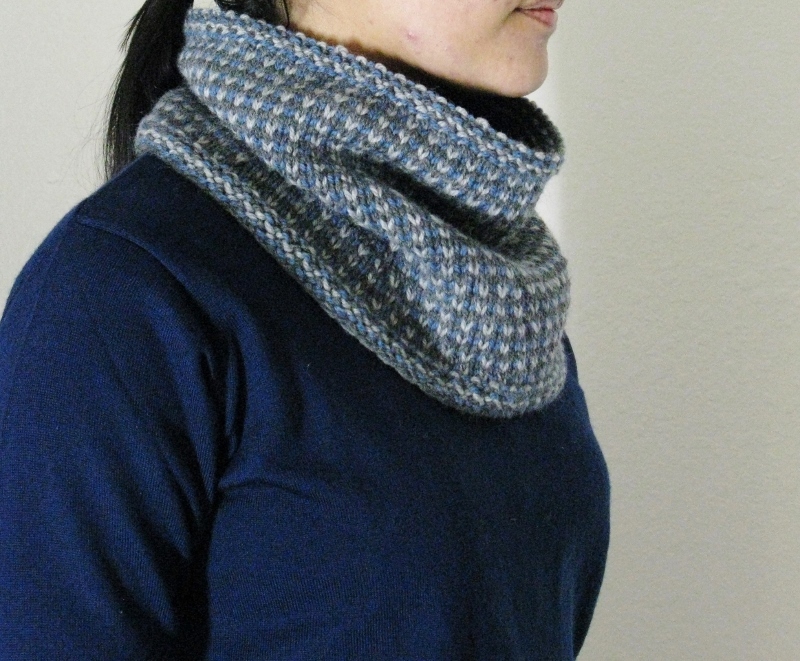 The cowl is shaped with decreases on three rows on its lower half. You decrease 8 stitches evenly on rows 13, 19 and 25 – going down from a total of 123 stitches to 99 stitches. [I could not do this completely unobtrusively because of the color changes, but that doesn’t bother me because the slight staggering of stitches isn’t noticeable when I put on the cowl. The pattern includes instructions for decreasing (the way I did) but if you know of another method to achieve cleaner decrease lines, you could use that instead]. For the samples in the pictures above, I used the Patons Classic Wool and KnitPicks WotA. In the Green-Red-Blue scarf, green is the main color (MC), red is the first contrast color (CC1), and blue is the second contrast color (CC2). In the Grey-Blue scarf, dark grey is the main color (MC), light grey is the first contrast color (CC1) and blue is the second contrast color (CC2). When slipping stitches, make sure the yarn is always on the wrong side of the work. On the right side of the work, stitches are slipped wyib; on the wrong side of the work, stitches are slipped wyif. All stitches are slipped purlwise. Using the main color (MC), loosely cast on 123 stitches. These first 6 rows form the lower border of the cowl. The following rows 7 to 12 form the pattern repeat for the main body of the cowl. The first and last stitches of every row are selvage stitches, and are knit. All the stitches between the first and last stitch are worked in the pattern stitch. ***Please note that on row 12, you need to place markers for decreasing. Repeat rows 7-12 eight or nine more times, or till you get your desired height for the cowl body, making decreases at the same time. Decrease eight stitches each on rows 13, 19 and 25 (the first rows of the second, third and fourth pattern repeats) evenly. A total of 24 stitches are to be decreased. First decrease row – On row 13:- [knit in pattern to the marker, sm, ssk] 4 times; [knit in pattern to 2 stitches before the next marker, k2tog, sm] 4 times, knit in pattern to the end of the row. You now have 115 stitches remaining on the needle. Knit rows 14-18 in pattern. Second decrease row – On row 19:- [knit in pattern to the marker, sm, ssk; knit in pattern to the next marker, sm, sl1, ssk] 2 times; [knit in pattern to 3 stitches before the next marker, k2tog, sl1, sm; knit in pattern to 2 stitches before the next marker, k2tog, sm] 2 times, knit in pattern to the end of the row. You now have 107 stitches remaining on the needle. Knit rows 20-24 in pattern. Third decrease row – On row 25:- [Knit in pattern to the marker, SM, ssk] 4 times; [knit in pattern to 2 stitches before the next marker, k2tog, SM] 4 times, knit in pattern to the end of the row. You now have 99 stitches remaining on the needle. Knit the next 5 rows of the pattern. Repeat rows 7 to 12 five or six more times (total 9 or 10 repeats of stitch pattern) or until your cowl is about half an inch shorter than the height you want, ending with the last row of pattern stitch on a WS row. For the top border, switch to size 7 needles (or size 6 if you want the cowl to fit closer around your neck at the top). WS – Using MC, bind off all stitches knitwise. 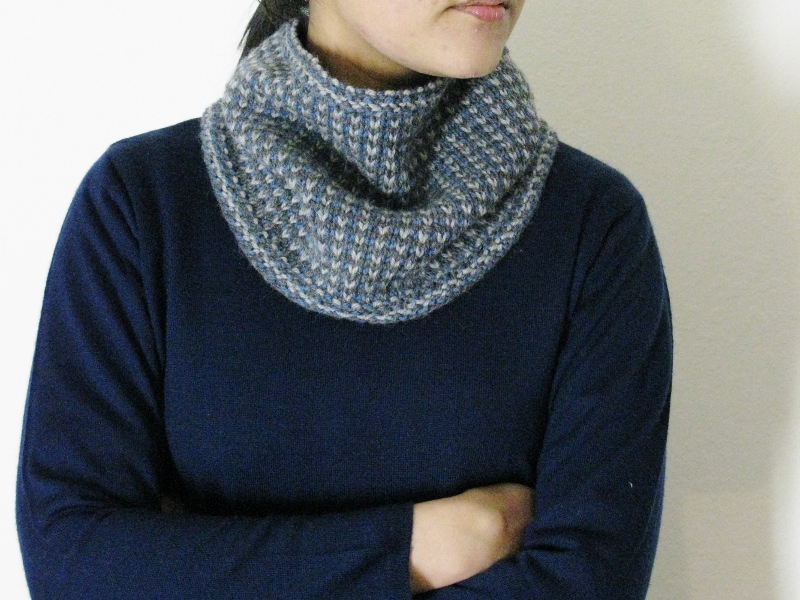 Block the un-seamed cowl to desired measurements. Seam the left and right edges of the piece, weave in ends. Are the slipped sts in SSK also slipped purl wise? The SSKs are worked knit-wise, as you would normally work them. After you have done the decreases in the main body and ended up with 99 stitches, the pattern says “Knit the next 5 rows of the pattern.” Then you are supposed to repeat rows 7-12 five or six more times for a total of 9 or 10 repeats of the stitch pattern. 1) Shouldn’t it be 6 rows of the pattern? 2) Shouldn’t it be a total of 6 or 7 repeats? The last decrease row – the one that leaves you with 99 sts – is the first row of the 6-row stitch pattern (and it’s being worked on the 4th pattern repeat). So you’ll need to work 5 more rows of the stitch pattern after the decrease row, before starting the next repeat. It’s a total of 9 or 10 repeats because the decreases are made on the first row of the second, third and fourth pattern repeats. If you’re working 5 or 6 additional repeats after the last decrease, you end up with a total of 9 or 10. I just made some changes to the blog post to make it less confusing. I’m hoping that helps! The clarification has been very helpful. Thank you. It is such a pretty cowl. For some reason I can only get 6 stitch decreases on row 19. It should be eight stitches. What am I missing? I’m not sure what’s missing. Do you have 115 sts on the needle before starting row 19? You should have 107 sts after working the decreases. But, as I say in the pattern, you need not work the decreases exactly as written. As long as you can continue to work in-pattern after the decrease row without the decreases being too prominent, or not to your taste, you should be good. I wish I could offer more specific advice! Hope you’re able to figure it out! Beautiful pattern, do you the number of multiples to cast on for the pattern to make baby blanket? Hello again, I found my answer, CO odd # stitches. Thanks so much, Linda! You got it – odd number of stitches to follow the stitch pattern, plus maybe a few garter edge stitches on the left and right since you won’t be joining the edges. A baby blanket sounds like a really good idea! I should probably do one myself. Hi Bonnie! Rows 7-12 are the pattern repeat – maybe it’ll be easier if you think of these rows as the stitch pattern itself, row 7 representing row 1 and row 12 representing row 6. The first decrease row is row 13 of the cowl – which is the first row of the 6-row stitch pattern (and also row 7). I worked the decreases on rows 13, 19 and 25 of the cowl, and those are all the first row of the stitch pattern (which is row 7 as written in the pattern). I’m sorry it’s so confusing! I should rewrite it to make it clearer. For now, just look at rows 7-12 as the stitch-pattern repeat.